Hot pinks, soft blues and neutral tones are just some of the colours ringing in. Three Birmingham City University (BCU) School of Jewellery (SoJ) students demonstrated exactly what is possible. Following recently announced changes to the Women’s Jewellery Network board, the female-focused trade organisation is. 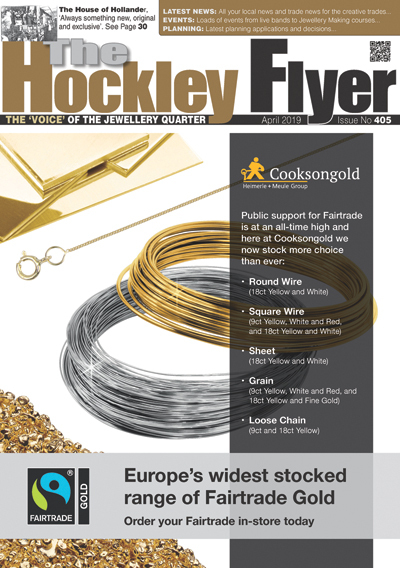 Gecko Jewellery have confirmed another successful year at the Jewellery & Watch exhibition at the. ‘Make your Mark 2019’, organised by The Goldsmiths’ Company Assay Office took place at Goldsmiths’. Following several successful offline events and online social media campaigns in 2018, the Women’s Jewellery. Over 10,600 Royal Mint coins went on ‘trial’ in London on the 29th January 2019,. Birmingham-based trade event, Jewellery & Watch, has partnered with the National Association of Jewellers (NAJ). Jewellery & Watch Reveals ‘The Studio’ Seminar Schedule and Spring Fair Keynote Speakers. Seminar and. Domino Jewellery have launched their 2019 wedding rings collection with newness not only across the. ‘Jewellery & Watch’’ will get the industry calendar off to a successful start at Birmingham’s. On 5 February 2019, London’s Goldsmiths’ Hall will host the UK’s biggest careers event for. Long-running Jewellery & Watch exhibitor, J&K Henderson (the Henderson Group) will lead the charge in. Birmingham based British Allied Trades Federation (BATF) received the commemorative ‘Silence Fell’ silverware to mark the. Isabella Liu who has been named as both Influencer and Ambassador for the China Britain. Gecko Jewellery has launched a range of bee-inspired sterling silver- and gold-plated jewellery in collaboration. One of the Goldsmiths’ Company’s greatest treasures, the Royal Clock Salt has been on loan. Award-winning British fine jewellery manufacturer Hockley Mint will showcase an extensive collection of new diamond. Domino will relaunch a revitalised Rosabella collection at this year’s IJL. The new Rosabella range. The British Society of Enamellers (BSOE) will launch celebrations for its 35th anniversary year with. Domino Jewellery will launch a refreshed, extended Anthology collection at IJL 2018, including four new. Domino Jewellery added a new exhibition to its 2018 calendar, with the team making their. Renowned for their innovative, quirky designs, the new ‘Bright’s Collection’ from Deakin & Francis is. A jewellery design ‘star of the future’ Daisy Grice, who trained at the Birmingham School. Domino continues with its focus on customer support with the relaunch of their customer website. Unity wedding bands have launched further new styles to their Diamond set wedding band range.. Images: Mark Cocksedge The New Designers Goldsmiths’ Company Awards were announced at the Business Design. City of Wolverhampton Trading Standards have fought off stiff competition to win the British Hallmarking. WB The Creative Jewellery Group prides itself on its focus on ethical jewellery manufacture and. Domino will launch its major Diamond Ring Mounts (DRM) product range for 2018 with a.